Tad is a native of Louisville and is a married father of three daughters. He graduated from Indiana University earning a B.S. in Finance and a B. A. in History with High Distinction in 1988. While at Indiana University, Tad was an active member of Phi Gamma Delta (Fiji) fraternity. 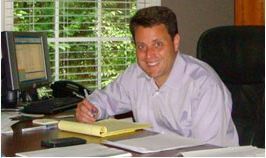 Tad earned his law degree from the Brandeis School of Law at the University of Louisville in 1995. Before becoming a lawyer, Tad spent four years as a commercial lender managing a portfolio with over $100 million in outstanding loans in six states. After law school, Tad practiced at two firms working for the same partner, before founding Adams Law Group in July, 2000. Since 1988, Tad has been involved with complex finance transactions, commercial real estate developments, representation of start-up companies and Chapter 11 Bankruptcies, as both a lawyer and as a commercial lender. His practice includes representing real estate developers, lenders, businesses and high net worth individuals and their families. He also represents various parties in workouts and bankruptcies. Tad is a member of the Kentucky Bar Association, where he previously served as Chair of the Real Property Section. He has lectured at numerous industry engagements on topics ranging from workouts and Chapter 11 bankruptcies, to commercial real estate matters, and low-income housing tax credits. Tad is an active member of the community. He has served on the Boards of the American Heart Association, the IU Foundation- Well House Society, and the IU Alumni Club of Louisville and Southern Indiana. In his free time, Tad enjoys playing tennis and cheering on the IU Hoosiers.